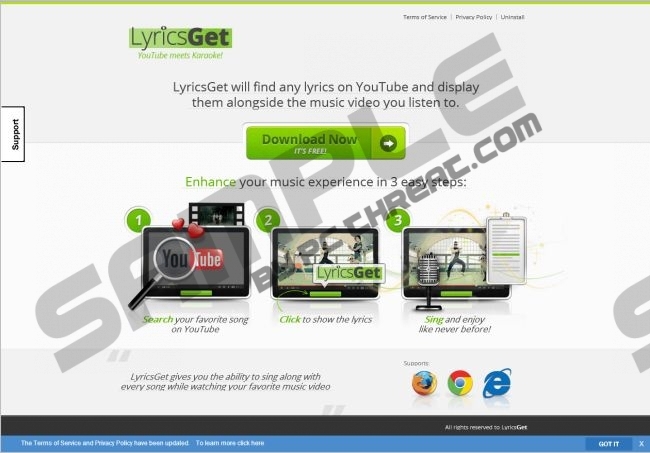 LyricsGet is an undesirable and unreliable browser extension which in the past was available on the official download page lyricsget.co. The tool is no longer available on this site; however, you may acquire it bundled with other software. Unfortunately, such activity is highly dangerous because illegally installed applications often travel packed with adware and malware. In fact, we categorize the plugin as an advertisement supported program as well because it is affiliated to third parties who can display all sorts of suspicious ads and offers alongside the supposedly authentic lyrics. As a matter of fact, the plugin often fails to present lyrics when watching YouTube videos, and if you are presented with them, it is most likely that they will be incorrect. Therefore, there is no reason to postpone LyricsGet removal. The suspicious application derives from the Lyrics family, and such browser extensions as LyricsBuddy, Lyrics Fan and LyricSing belong to it as well. Just like LyricsGet these plugins get installed on all active Google Chrome, Mozilla Firefox and Internet Explorer browsers, meaning that if you have all three of these browsers installed, all of them will have the plugin attached. As soon as the installation of the add-on is complete, you will notice that your Internet connection speed has decreased and that different advertisements are showing up. You may be presented with pop-up prize giveaway certificates, virtual coupons, online surveys, and various different offers. Trusting these is not recommended to anyone. We strongly recommend using automatic malware removal software to delete LyricsGet and other threats which may be running on the system. If you are not worried about additional malware and you are not interested in safeguarding your Windows system with authentic security software, you can try to remove the undesirable, intrusive application using these manual removal instructions. Please install a malware scanner to examine the PC if you do choose the manual option. Go to Uninstall a program, then right-click the one you wish to delete and select Uninstall. Open the Start menu, click Control Panel and then navigate to Uninstall a program. Navigate to the Task Bar, click Start to open a user menu and select Control Panel. Quick & tested solution for LyricsGet removal.